failed. If we had gone short on the basis of cyclic predictions, the only tactic to employ on 890413 is to exit that short for a loss as quickly as possible. Then we would shift strategy to trade the S&P 500 in the trend mode. In the trend mode, one tactic you can employ is to use the instantaneous trendline as the value of your stop on a day-by-day basis. 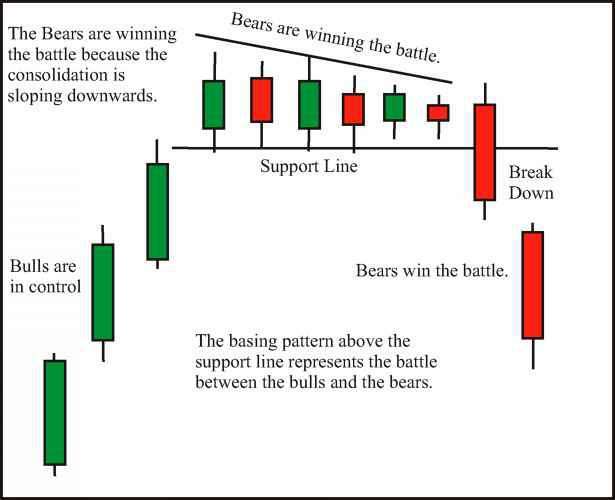 Setting your stop this way has the disadvantage that the gap between the price and your stop can sometimes be large, exceeding the daily limit move. This gap is not terribly significant if you have established a profit position because it is your intent to hold t he posit ion until the trend mode is over. Nonetheless, more conventional trend-following techniques, such as a parabolic SAR, are recommended when the market is in a trend mode. Figure 12-5 Trend Mode Ends When Price Touches the Trendline probably would have had us exit the long trade before MESA declares the trend to be at an end. Note that the dominant cycle measurement has spikes, indicative of an erratic measurement, while the trend mode is in force. 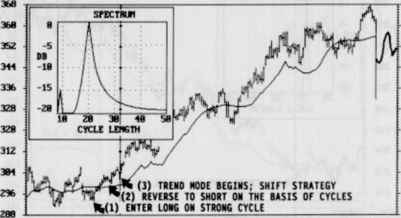 This erratic cyclic behavior when the market is in the trend mode is the reason we ignore all cyclic outputs, such as the prediction. 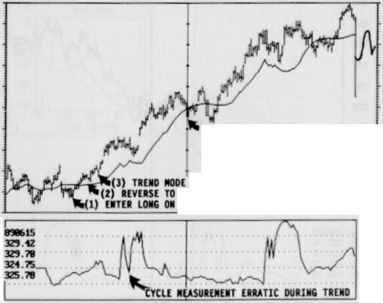 The dominant cycle measurements calm down and again become consistent near the end of the trend mode. Since the dominant cycle measurement has more stability near the end of the trend mode, we can have greater confidence in the MESA predictions.